Do you love pig? Then COCHON555 is for you. Tomorrow. 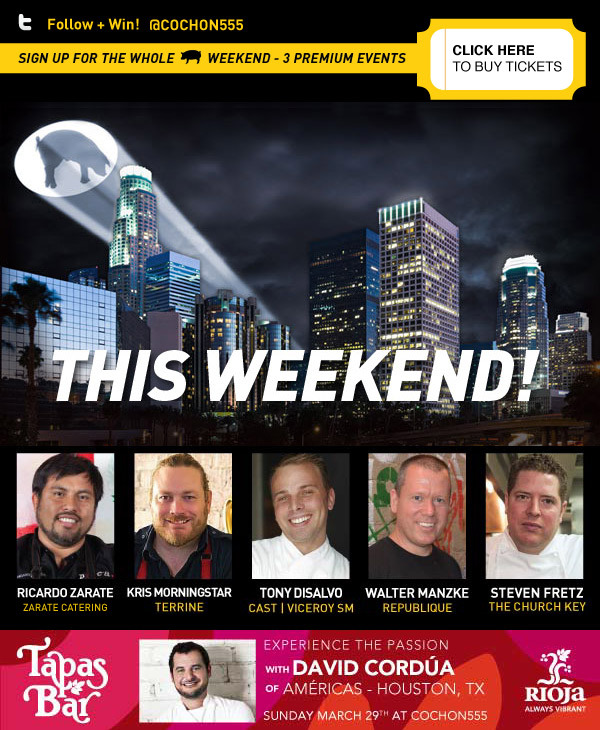 Sunday’s main event – Cochon 555 features five chefs cooking five pigs in a friendly competition. This year’s competing chefs include Chef Ricardo Zarate, Kris Morningstar of Terrine, Tony DiSalvo of Cast Restaurant, Walter Manzkeof Republique and Steven Fretz of The Church Key. The five chefs will prepare a maximum of six dishes with hopes to win votes from a crowd of hungry gourmands and celebrated judges. They will be preparing the following heritage breeds from family farms that include a Red Wattle from Walnut Creek, Large Black from Cook Pigs Ranch, Hampshire from Rainbow Ranch Farms, Kune Kune from Old Reminisce Farms and an Old Spot from DG-Langley Farm. It’s almost sold out, wait too long, then you get none!